What can I send to Canada? What items are restricted? Customers may be required to pay an additional fee of c. $16 CAD directly to our courier partner to cover the cost of processing the shipment for customs clearance. By continuing you agree you have read and understood the self-clearance customs information on our Canada information page. This route is not suitable for holiday baggage and you may be required to personally visit a customs office to complete clearance. If you’re going to Canada for an extended trip, an adventure holiday or a fly-drive holiday, taking everything you need in one case can be tricky - especially if you’re going in winter and have bulky jumpers or ski gear to bring with you. Send My Bag can help; we can take care of your extra baggage, thus relieving you of significant stress and hassle. We pick up your baggage and take it to your destination accommodation, whilst you enjoy a leisurely journey without being burdened with too much baggage. This way, you don’t incur any extra and expensive baggage charges in the airport, and you won't have to wait around whilst any bulky items or large gear get sorted separately. Many people who are taking extended trips and feel that the usual baggage allowance isn’t enough can use Send My Bag to take the extra items they need. Those trying out one of Canada’s numerous ski resorts, who may not want the hassle of taking their own gear themselves, but don’t want to hire any, can also use our services. For students studying in Canada, sending bags is a great option. It means they can bring with them many more of their possessions than they could take on a plane, and they can have it all shipped back home again when the semester ends. Having items from home makes adjusting to life abroad much easier and helps students focus on their studies. If you are going on an activity holiday to Canada, or if you are moving there permanently, you can send your things to Canada with Send My Bag. This way, you will be able to bring many more items than you could if just checking in a couple of bags into an airplane’s hold. You can also avoid having to wait around at bag drop or luggage carousels and get on with enjoying the journey. Send My Bag has many international routes, with affordable rates for each route up to a massive 30 kg. To find out more about sending luggage to Canada, visit our ‘How it works’ page, or our ‘FAQs’. Canada is home to over 2,300 golf facilities, of which St George’s Golf Club, Cabot Links and Highland Links are among the best. If you want to take in a few rounds of golf on your trip to Canada, you can do so with your own clubs, by shipping them to Canada with Send My Bag. You won’t have to drag your clubs behind you and you will also avoid any oversized baggage fees from your airline. So consider sending your golf clubs with Send My Bag. Make sure you find out how best to prepare your golf clubs for transit by visiting Send My Bag's information page on how to send golf clubs. Canada has a wealth of ski resorts to choose from, from the well-known Whistler area, to Banff and Mont-Tremblant. You won’t need to hire skis when you are there, instead you can bring your own by sending them with Send My Bag. If you send your skis, you won’t have to carry them with you to and from the airport and you can avoid your airline’s oversized baggage fees. To find out how to send skis to Canada, including how to package them correctly, read our information page on sending skis. If you are attracted by Canada’s stunning landscapes, and are moving there for good, you will need to do some research into international removals to Canada in order to transport all of your possessions. Before you hand over anything to the movers, however, ensure that all your items are carefully packaged so that they won’t get damaged in transit. Use appropriate packaging for your items and secure everything well. If you are moving to Canada to study, you will need to bring lots of your things with you to help set up home in your student accommodation. Apart from everyday essentials you will also need to bring textbooks and other reading material for your course, plus items like DVDs to help you pass your free time. Some of the top-ranking Canadian universities include University of Toronto, McGill University and University of British Columbia. To find out more about student shipping to Canada visit our student shipping page and get your 10% student discount. You could send a parcel to Canada with Send My Bag. Friends and family could use this option to send you a care package or to forward something that you have left behind. Make sure you choose a good solid box when sending a parcel to Canada and tape it up well so nothing gets damaged in transit. Also make sure you know about rules regarding personal effects and brand new items (see below). Read more on our parcel shipping information page to find out what you are permitted to send with Send My Bag, and how to package your items. Air freight is one option for sending big bulky items, such as a dining table or a chest of drawers, to Canada. Sending items by air freight usually takes one to two days, which is normally faster than sea freight shipping, but generally more expensive. What you have to pay will depend on the weight and size of your shipment. You will probably also have to use the services of a customs agent to handle customs clearance. And, you need to work out how to get your items to and from the airport, which means that costs could quickly mount up. If you send internationally by air freight to Canada your items will likely arrive at one of the major airports, such as Toronto, Vancouver or Montréal. Instead of air freight, you could try sea freight or container shipping to move your possessions to Canada. Again, this option is usually used when transporting large items, like a console table or a wardrobe. Sea freight usually means shipping items in large containers loaded onto cargo ships. It can be cheaper than air freight, but you will still need to use the services of a customs agent and will need to sort out how to get your items to and from the ports, which means it could cost more than expected. When using container shipping to Canada your items will most likely arrive by ship at one of the major sea ports, such as Vancouver, Toronto or Prince Rupert. Significantly easier than expected. My bike showed up well before my arrival. From the moment it was picked up, to the moment it was delivered, I was kept informed, good service, highly recommend. Holiday baggage and other time sensitive packages should not be sent on this route. Please see further information below. If shipping to British Columbia we will require a copy of the consignee’s Passport. You will also be prompted to answer a few questions from within your Send My Bag account to generate a ‘letter of explanation’, which will inform the customs authority of your reason for shipping items into Canada. Send My Bag will then submit these documents to Canadian customs to request clearance. Once clearance is granted your bag will be released to Send My Bag for delivery to your destination address. When shipping to British Columbia, you will need to provide Send My Bag with a copy of your Passport and complete a ‘letter of explanation’ from within your Send My bag account. Shipments can only be cleared once the consignee has arrived in Canada as you must also supply Send My Bag with a copy of your permit or visa and entry stamp. We can only accept images/scans of the original documents issued at your point of entry into Canada, email confirmations of permits and visas issued prior to entry are unfortunately not acceptable. As you must be in Canada for the shipment to be cleared we highly recommend your shipment is timed to arrive at a similar time to you. After placing your order you will be prompted to provide Send My Bag with a copy of your passport and to complete a ‘letter of explanation’ as above. To complete clearance in Ontario, all customers will either need to self-clear the shipment in person from a local Canadian Border Services Agency (CBSA) location (see next section on shipping to other states), or obtain the relevant documentation from customs (CBSA) at their port of arrival and provide this to our courier partner to complete clearance on their behalf. When travelling to Ontario your airline will issue a Declaration Card (E311 form) to declare to customs on arrival on which you should tick the option for ‘I/we have unaccompanied goods’ under the section headed ‘I am/ we are bring into Canada’. Upon landing, the Declaration Card can then be handed over at the CBSA desk who will then issue a Personal Effects Accounting Document (BS186 Form), to assist with this process it is also recommended that you have a copy of your packing list detailing the contents of your luggage with you. This document can then be submitted to our courier partner electronically with a short electronic statement providing them with authorisation to clear the shipment on your behalf. Send My Bag will email the relevant contact information to submit these details to our courier partner upon the shipment’s arrival in Canada. Should this document not be obtained at the airport, self-clearance will be required as outlined in the following section. Information for Canadian and Non-Canadian Passport holders shipping to any state other than British Columbia or Ontario. If shipping to; Quebec, Nova Scotia, New Brunswick, Manitoba, Prince Edward Island, Saskatchewan, Alberta, Newfoundland and Labrador, Northwest Territories, Yukon or Nunavut, the named consignee will have to visit a local Canadian Border Services Agency (CBSA) location. CBSA locations can be found here, please ensure a CBSA location is accessible to you before placing your order. (Please note, we have been made aware that shipments bound for Ontario that require self-clearance are resulting in customers being asked to attend the CBSA office at the point of the shipments entry - usually Hamilton Airport). Once your luggage arrives in Canada we will contact you via email with a contact number that needs to be called in order to obtain a “Self-Clearance Manifest”, this unique document will then be emailed to you to print and present to your local Canadian Border Services Agency (CBSA) office. Once stamped by the CBSA officer, the documents will need to be emailed back to Send My Bag in order to allow the shipment to be released for final delivery. Due to the requirements of shipping to these states, you should ensure you are arriving in Canada at a similar time to your shipment. Goods that have not been cleared within 40 days of arrival into Canada will be assumed “abandoned” by customs and therefore ownership of the goods will transfer to the Canadian state for disposal. It is advised that you do not ship personal effects valued at more than $2500. Personal effects are usually assessed as used items which have been in the sender's possession for 6 months or more. If your bag is checked by Canadian customs and is found to contain brand new or commercial items your shipment may be assessed for customs duties and taxes. If you are sending Christmas gifts please check with Canadian customs so you are aware of potential customs duties, follow advice given and attach all necessary documentation. In order to demonstrate your shipment consists of personal effects, you will be required to complete a brief non generic packing list online, entries to be made in the format: "6 x Cotton Blouse, 1 x Shorts, 3 x Denim Skirt" and so on rather than as "10 x Used Clothing". Customs processes and allowances do vary by country and as such we advise all travellers take 5 minutes to check how their personal circumstances and what they are sending will be assessed under the prevailing Canadian customs regulations. Canada is a cultural melting pot, made up of settlers from around the world, which means that there are a number of languages spoken in Canada. The main languages are English and French, as well as indigenous languages. It is part of the Commonwealth, so the sovereign is Queen Elizabeth II. Canada uses the Canadian Dollar. The vast country of Canada covers a wide range of different weather systems. In many places during the winter months it gets very cold, and in the summer some places see scorching temperatures. So you can enjoy ski holidays for a good amount of the year and spend time sunbathing in the summer months. The rest of the time, you can take in the diverse scenery. 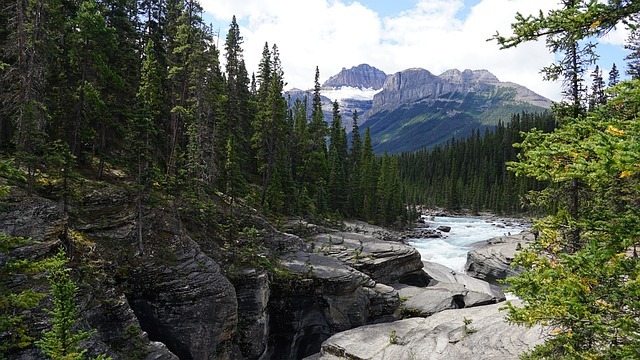 To get you started, Canada has 37 National Parks and 8 National Park Reserves to enjoy, which protect its natural beauty and delicate eco systems for future generations. They make fantastic places to explore, whether on foot, while kayaking, rafting or rock-climbing, to name just a few of the activities you can take part in. The biggest national park is Wood Buffalo and the oldest is Banff. National parks also cover marine conservation areas. However, there is not just flora and fauna to enjoy. Canada has some amazing cosmopolitan cities to explore including: Montreal, Vancouver, Toronto, Calgary and Quebec, which are lively and exciting destinations in their own right. Toronto and Montreal are pretty close to the US-Canada border which means you can also take a day trip across the border, not forgetting Niagara Falls, which sits on the border with New York State.